USB Flash Drive Packaging Examples. The Amaray Overwrap artwork is printed, cut, and inserted in the USB Amaray case. This case is the same size as a standard DVD case. Optional inside panel artwork gives you more room for package information or marketing material. When the USB Amaray case is open, you see the one sided insert on the left panel. The USB Flash drive is held in place with a low tack glue dot (similar function as a multi use sticky note). This glue dot does not damage the USB. The right panel is flat. Unlike a standard DVD case, our USB Amaray style case does not have a disc hub area built into the mold. Single quantity orders placed in bubble mailer. The 2 Panel artwork is printed, cut, then folded. 2 Panel is folded and placed inside the front panel of the USB Jewel case. When the USB Jewel case is open, you see the inside or left panel. The USB flash drive is placed inside the case. When the case is closed, the USB drive is held snug in place. Front of closed USB Jewel case. Back of closed USB Jewel case. There is no back tray. Since it's clear from the back, you see the inside panel as well as the USB Flash drive. The USB Flash drive fits snugly in the case. We use one low tack glue dot (similar function as a multi use sticky note) to secure the drive in place. The glue dot does not damage the USB. USB Flash drive inserted inside the 2 Panel folded artwork placed inside a clear resealable sleeve. The folded 2 panel artwork forms a two sided cover that contains the USB Flash drive. One side of the 2 Panel image is visible from the front side of the closed sleeve. The clear resealable plastic sleeve holds the entire package together. The other side of the 2 Panel image is visible from the back side of the closed sleeve. Single quantity orders placed in bubble mailer which can be sent at a low cost letter rate if you choose standard shipping. Thin, mostly flexible packages can usually ship at the much lower cost letter or flat rate (based on the USPS guidelines). There is no tracking for domestic letters or flats which is part of the reason it costs less. 1" x 1/2" small logo style image on USB Flash drive. 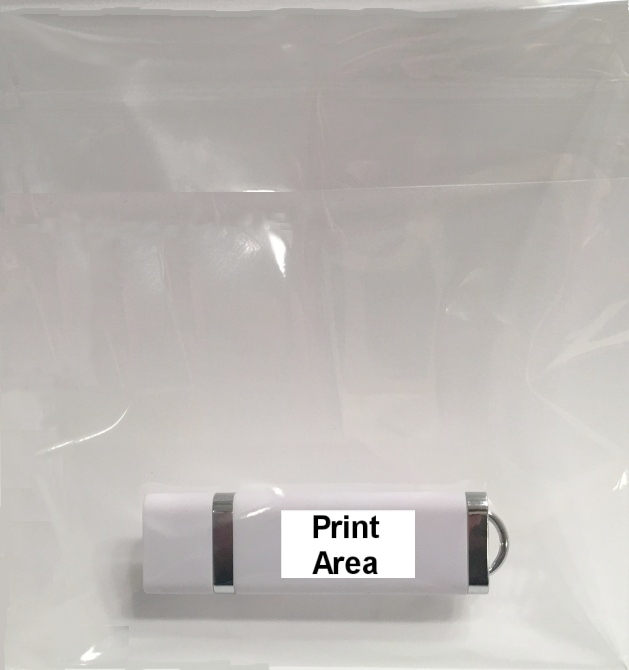 Flash drive is placed in resealable clear sleeve (5" x 5" in size). This is a very economical choice if you don't need extra packaging and printed artwork (saves about $0.50).